Georender 1 was published by www.lagoonline.com in 2002. 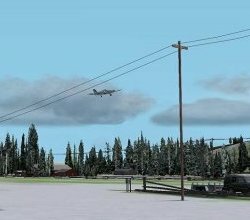 It adds scenery of Flying M Ranch and Ranger Creek to Microsoft Flight Simulator 2002.
: " What was strong in the Microsoft Flight Simulator 2000 edition is even stronger in this new version. The blending of the scenery into the surrounding is done with such care that we dare you to find where it ends. The choice of colors is superb and does not make the objects look like Walt Disney designed them. What is new in these editions is that many aspects change with the seasons. While some changes are obvious, others are unique, for example a river that expands in spring when the snow starts to melt. From the soda vending machines to the high resolution mesh, unprecedented quality from the master of bush scenery. And in case you wonder� no, it will not slow down your system, as it is programmed with framerates in mind. This airport is very well known in the region as a meeting point for pilots. On days when the weather is fine the airport often runs out of parking space (for cars AND aircraft). That�s not surprising because the airport is located in a beautiful setting and has a lot to offer to visitors. From a great lodge to horse riding, people come here to shake of the stress of the big city. While the airport is not very difficult to approach it has some very special features like a foot path that crosses the runway and a lake that seems to be part of the runway. Stay concentrated and you�ll be fine. 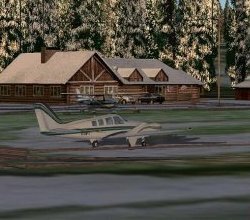 Located between high peaks in a narrow valley, Ranger Creek is without a doubt a spectacular small airport. There is a lot of camping grounds very close and even on the airport you will find campers that are attracted to the aircraft and the small shop that serves the local community. When you buy your groceries, tell shopkeeper Jane that we made it back to our home and will be back next year. As an airport this must be one of the most complex airports to approach. Even when there is no wind or turbulence (and that is very rare here) the mountains make it hard to get to and from the airport. If you don�t know what you�re doing you end up as part of the scenery. 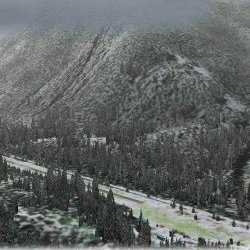 Good thing LAGO added a tutorial written by Steve (Bear) Cartwright that will teach you how to get to the airport. One tip, don�t load up with passengers, luggage and fuel. If you do you�ll have to fly the whole valley to get of the mountains. If only they would trim down those trees that are ridiculously close to the runway. "